Every purchase of GuideSIGN SIGMA comes with your choice of a federal or regional standard sign library. Supplemental CAD sign libraries can be added to GuideSIGN SIGMA, making a very scalable and customizable solution (view sign libraries here). GuideSIGN SIGMA also supports libraries of user drafted blocks/cells and guide panels designed using GuidSIGN. Improve the quality of your traffic signing and reduce errors with visually clear and properly positioned signs. 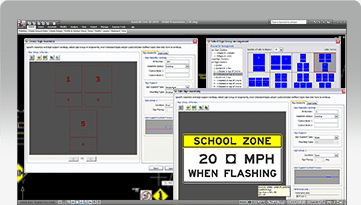 With GuideSIGN SIGMA, sign assemblies can be precisely placed along a roadway in relation to other geometric elements while maintaining safe clearances. GuideSIGN SIGMA’s dynamic reporting features give you all you need for new projects and for maintaining existing designs. Overview Show the way forward Take a video tour of GuideSIGN SIGMA – Innovative software for traffic signing plans. This video offers a brief look at GuideSIGN SIGMA’s main features including dynamic sign assembly orientation along a roadway corridor, reference line and offset reference definition, and custom report building. Take a video tour of GuideSIGN SIGMA – Innovative software for traffic signing plans. 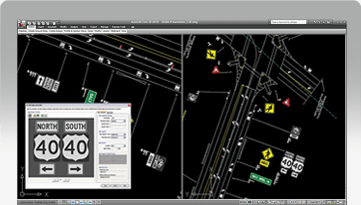 This video offers a brief look at GuideSIGN SIGMA’s main features including dynamic sign assembly orientation along a roadway corridor, reference line and offset reference definition, and custom report building. https://transoftsolutions.com/wp-content/uploads/2016/03/SG_DYNAMIC-SIGN-ASSEMBLY-CREATION_big.png Overview DYNAMIC SIGN ASSEMBLY CREATION With SIGMA, you can select different sign arrangement templates to work with or create your own custom arrangement for sign assembles and set mounting types (ground, overhead, structure), choose multiple sign groups, and denote assembly status. Each sign assembly is assigned an ID number and can include custom notes for reporting. With SIGMA, you can select different sign arrangement templates to work with or create your own custom arrangement for sign assembles and set mounting types. https://transoftsolutions.com/wp-content/uploads/2016/03/SG_SIGNASSEMBLYEDITING_big.png Overview SIGN ASSEMBLY EDITING Easily change the status of an existing sign assembly and sign sizing, or add, remove or switch signs and sign groups within the defined assembly. Placed sign assemblies in the drawing can also be updated with status (replace, existing, proposed, remove, relocate) for sign maintenance or new installations. Easily change the status of an existing sign assembly and sign sizing, or add, remove or switch signs and sign groups within the defined assembly.